There have been a few times where a fact was presented to me, cold and hard and entirely out of the realm of criticism, and the unbiased communication of the fact shifted the entire lens through which I view the world. Good poetry, like good theory and philosophy and mathematics are powerful in that they can destabilize the foundation of what we have forever accepted as truth. I am speaking of theories that philosophers have spent years attempting to disprove but persistently failed. It is in the failure to disprove, it is when a piece has surpassed debate, that then we must make room in our rewriting of our own stories as well as the stories of the world. This is hard. It is hard to accept something as integral to our identity as the stories we tell could also be so critically false. We have beliefs about literature; we value the narrative voices we consume and internalize them as a means to translate value from our experiences as the protagonists of our own reality. Jordan Abel’s book of poetry, Injun, destabilizes Western texts and forces us to engage in a new conversation with the literature that has been a cornerstone for writers, readers and critics for hundreds of years. 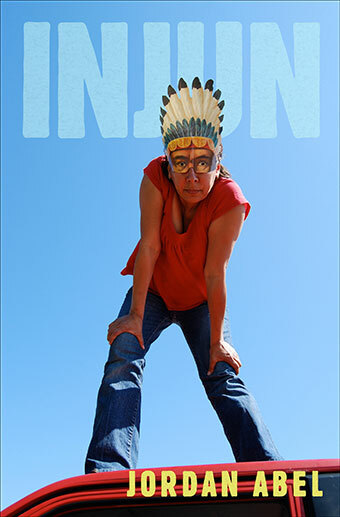 Injun is an artful exploration of the brutal colonialism that informs which voices are privileged. This privileging has orchestrated the acceptable methods, namely the way we use language, to frame both our public and personal histories. Abel employs an erasure method to Western novels, a process of cutting and repasting found texts, to probe beneath the surface of their decorative language. It is a sacrosanct retelling of these classic narratives—one that holds accountable authors through the simple representation of what was there, without argument or diatribes or magnanimous imagery. Abel violates personal beliefs—he deconstructs language that we have hoisted on a pedestal and interrogates the wide-range of racist implications such privileging connotes. Namely, through our authorization of ideologies that condone marginalization and subjugation of indigenous people. Injun is equal parts sociological and poetic exploration of the Western Canon. In many ways it can function as a map that guides us through stories as not only they exist on the page, but as they exist as idioms that take up space and are capable of influencing people as individuals, as members of a collective culture, and as global citizens. Each page is a flat fact. The Western has played a pivotal role in the way people valorize the political acts that for centuries have preyed upon indigenous peoples. As you scroll through line after line, the way one might follow a path from one geological site to another, it is fairly obviously beyond contention that these texts are also combat zones. This was written. Large groups of people edited, published, and purchased these words. These words are hurtful and hateful and ripe with injustice. Words can be battlegrounds. A word can be a kind of war. As these critiques emerge, and I hope there are more, I can’t help thinking about the way my own identity is being recreated. There are a few identities: me as Canadian, me as writer, me as reader, me as ethicist…they spiral. Yet so much of my own identity has been informed by myth. We create myths about literature and history so that we can excuse or applaud hedonistic efforts to disenfranchise large groups of people to take what we want but do not need. It is a disgusting method for moralizing the immoral. I feel I am maybe doing a disservice to Abel who is a skilled poet, who crafts language the way a darner might crochet, by focusing so intensely on the broader context of his stunning work. I want to pause at lines, “money shook like rattlers” or “two yards of bright luck” and yes—Jordan Abel is an expert poet, obviously. This process of traditional critique that I would use when entering into any other work just feels so disgustingly trivial. It is trivial because the work moves beyond these conventions in poetic analysis. This isn’t a book of poetry alone. It is a documentary about the way violence forces a breakdown in language and how interpretation shatters when we speak to manifest meaningless hate. The world collapses. The words are only sounds. Injun isn’t just good; it is singular and essential. Julie Mannell is an author of poetry, prose, and essays. She is currently completing her MFA in Creative Writing at the University of Guelph. Mannell is the recipient of the Constance Rooke/HarperCollins Scholarship, the Mona Adilman Poetry Prize, and the Lionel Shapiro Award for Excellency in Creative Writing. She splits her time between Montreal and Toronto. To view other reviews and content published in this issue please visit Vallum’s website. THIS HOLIDAY SEASON… GET AHEAD OF THE GAME!! Discover which Vallum magazine or chapbook subscription, print or digital, you should buy! Visit Vallum’s website to order this holiday season.